Would you like to know how subsurface conditions will impact your construction cost and schedule—even before you select the location for a new retail site or an alignment for a transmission line, pipeline, or highway? There’s a new way to reduce the unknowns in your planning process, because what we already know will help you. To reduce risk associated with site selection and due diligence, Terracon has developed a new way to anticipate site conditions. This predictive analysis, known as Stage1 GeoReport® (Stage1), can be applied to small sites, large sites, or linear projects. Utilizing innovative processes for compiling and managing data, we are streamlining site selection and providing clients access to a conceptual geotechnical model before field exploration takes place. Intrusive geotechnical exploration and testing of a site is required to design foundations, pavements, and retaining structures. This work usually takes weeks or months to complete. By the time the geotechnical exploration and testing is completed, many decisions have already been made about location and construction that would benefit from having the geotechnical data in advance. With technological advances in other industries creating an expectation that we should be able to find the information we need to know in seconds via internet-based, knowledge sharing services, the time needed to get even preliminary geotechnical information has become a painful experience. Until now. Tackling this challenge head-on, Terracon has created a powerful new tool that utilizes valuable data collected from more than 50 years of previous studies and the deep experience of our geotechnical practitioners across the country. We’ve meticulously documented the location and conditions encountered in nearly 300,000 projects nationwide and are adding more than 15,000 new projects annually to our database. Our Geographic Information Systems (GIS) database details information associated with each historical project location, allowing our practitioners to draw on a vast and readily-available database to supplement their understanding of local subsurface conditions. Digitizing the historical subsurface information creates a catalyst for our interactive, web-based GeoReport platform which combines the historical data collected by Terracon with data currently available in the public domain, and utilizes the opinion of a local, experienced Terracon geotechnical practitioner. Adding that essential local, personal experience, Terracon’s practitioners render a conceptual model of subsurface conditions, possible variability in those conditions, and a confidence level in the predictions. This is done incredibly fast. We deliver these opinions within days of your request, not weeks. It is easy to see how this combination of historical data, public domain resources, and local experience, delivered within one week, aids in the reduction of risks associated with unknown conditions on prospective project sites. The advantages go beyond risk reduction. With adequate confidence opinions, more precise project feasibility analyses are possible, and preliminary designs can proceed. A customized exploration and testing work plan can be dialed in to the known site conditions. 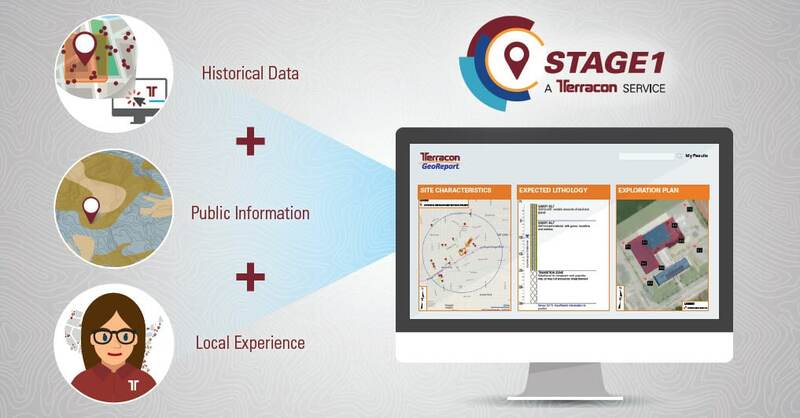 Stage1 is Terracon’s way of maximizing the value of data in site selection and design. We have developed systems to make this an easy, first look for any project that needs to discover what is below the surface allowing for the elimination of non-invasive sites and routes. Though not all risk can be eliminated, and all sites should be explored to allow final designs, Stage1 clients are better informed and able to anticipate geotechnical conditions, construction challenges, and reduce the inherent risks in development, saving valuable time and money. Our clients move forward into the next steps of geotechnical exploration and engineering much quicker than ever before.